STILLWATER, Okla. (AP) — Taylor Cornelius passed for 295 yards and five touchdowns in his first career start to help Oklahoma State defeat Missouri State 58-17 on Thursday night. He left some opportunities on the field, though. Oklahoma State coach Mike Gundy said Cornelius missed about six passes that he normally completes and said he was aiming instead of throwing. Jalen McCleskey caught two touchdown passes and ran for another score, Justice Hill ran for 122 yards and a touchdown and LD Brown added 115 yards and a score for Oklahoma State. The Cowboys gained 732 yards, the third-highest total in school history. 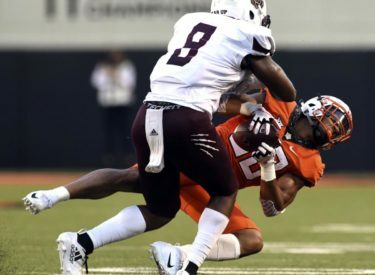 The Bears struggled from the start, and things got worse when linebacker Angelo Garbutt was ejected late in the first quarter for a helmet-to-helmet hit.